The earliest varieties can be sown under cover from late winter, with others following on from mid spring. Leeks are usually sown in pots or trays of potting soil and then transplanted into their final position when they’re big enough. Sowing is very easy. Start by sieving potting soil into pots or trays. Gently tamp the potting soil down then sow the seeds very thinly so they fall about an inch (2-3cm) apart. You can also sow two seeds per cell in a plug tray. Now cover them over with a thin layer of more potting soil, and water them. Keep the potting soil moist as the seeds germinate and the seedlings grow on. 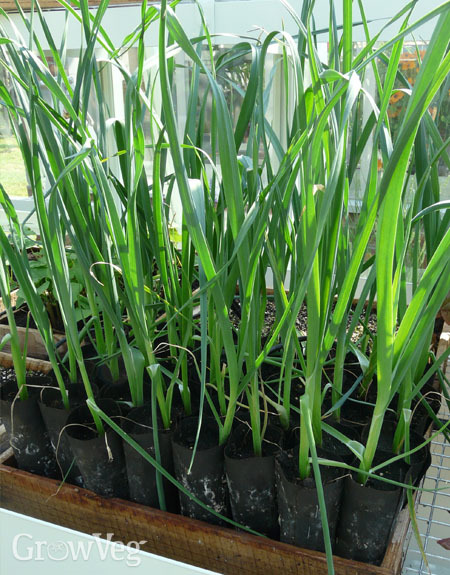 Before transplanting your young leeks make sure you’ve acclimatized them to outdoor conditions by leaving them outside for increasingly longer periods over the course of one to two weeks. They’re ready to transplant when they are six to eight inches (15-20cm) tall. If you want to maximize space you can grow fast-growing salad leaves in between your newly planted leeks while you wait for them to establish. Salad crops are shallow-rooted so they won't compete with the deeply-planted leeks. By midsummer the leeks will need all available space to encourage high light levels and good air circulation.